Happy Weekend, I hope you are relaxing and enjoying the weather. I love how hot it is here during the day and then by 5pm it cools off and feels crisp and fresh. We had sunshine all day! 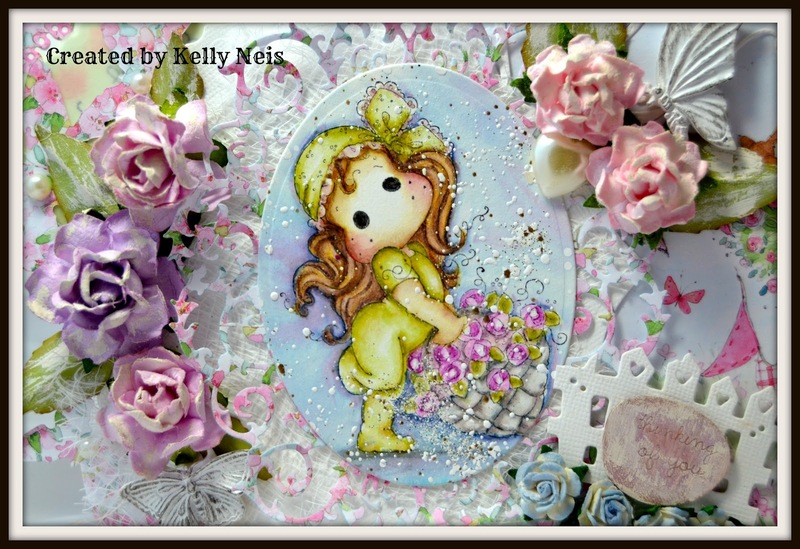 Tilda is colored in Distressed Inks and I used Stampendous Shabby White Embossing powder around her. I love how the glitter added to her basket like the flowers were falling out of it. Behind the card I put a green envelope and made the sentiment to go inside. I wanted to show more of the paper Annabelle's Garden because Tilda blended perfectly with it and the scene was so perfect for her. Sometimes I just color and then wonder what to do with my image, lucky for me she went perfect with this paper. 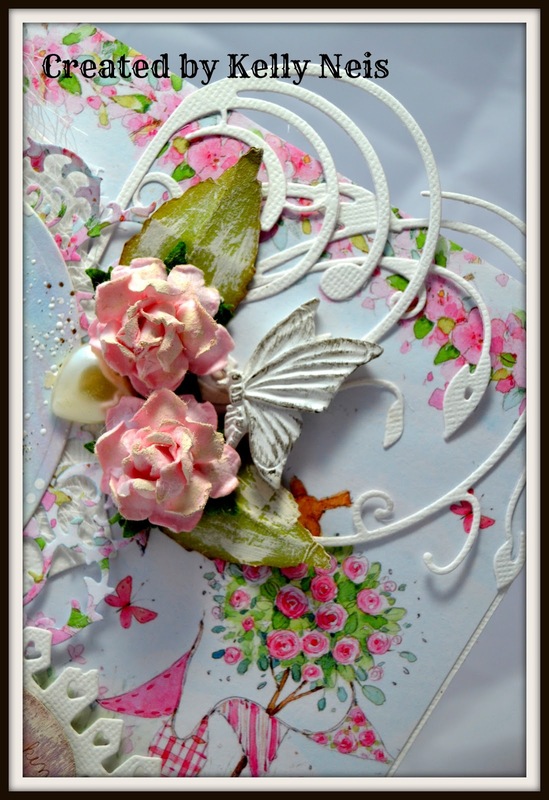 Prima resin butterflies and die cuts are used in the florals. 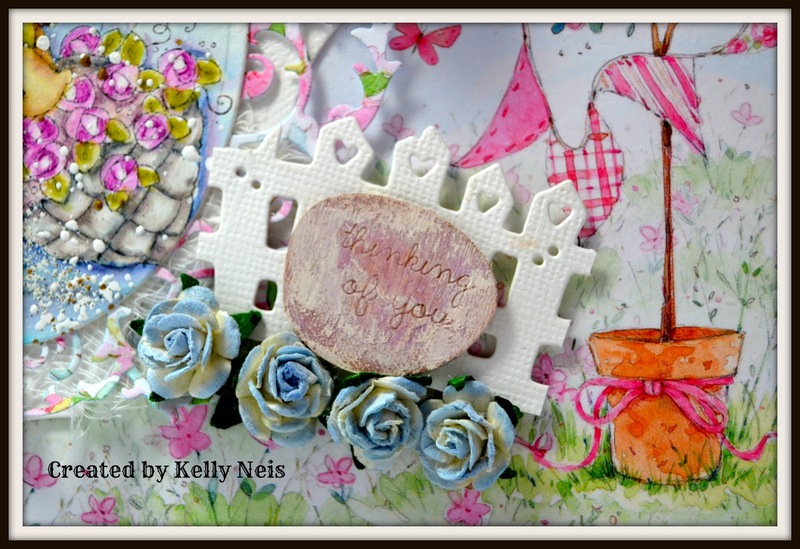 I used a chipboard sentiment piece, sprayed it with Prima bloom lavender, and then swiped some white paint on it. 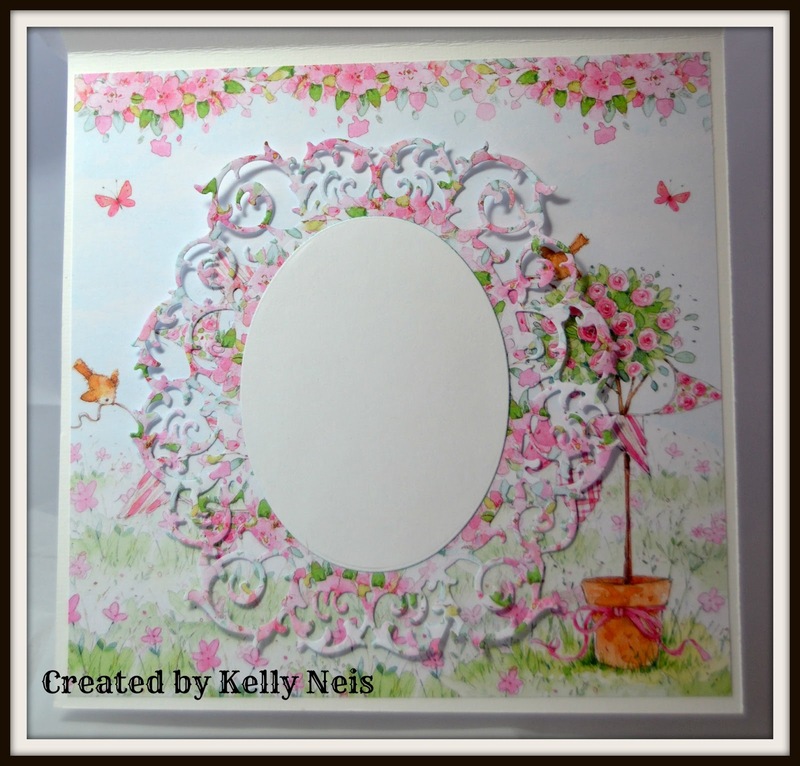 Here she is so girly and springy, great for a sunny day! The inside I used the same papers, you hardly have to do anything with them as they are so beautiful on their own. Thank you so much for stopping by my blog, you are all so sweet to me and I enjoy your opinions! Have a blessed rest of your weekend! did I loose my comment???? :( Kelly your card is totally adorable. I tcould not be sweeter. Love love all the pretty elements you decorated it with. Love the pastel colors and the white. and tilda is wonderfully colored. Gorgeous. Hugs. This is gorgeous Kelly! Fab colour scheme, great papers and dies and it all pulls together to make a super pretty card. What a beauty!!! I love your coloring and your details are outstanding. A treat for the eyes!! This is just beyond gorgeous. 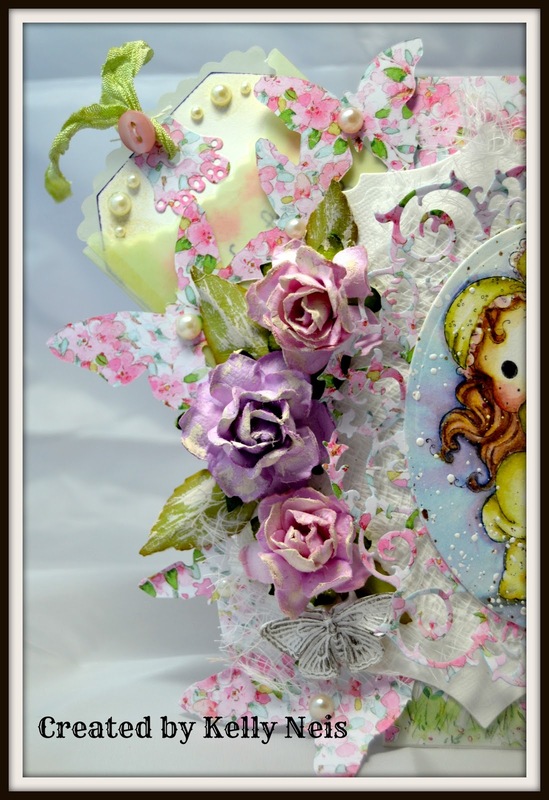 So pretty and girly with wonderful little details to feast on. 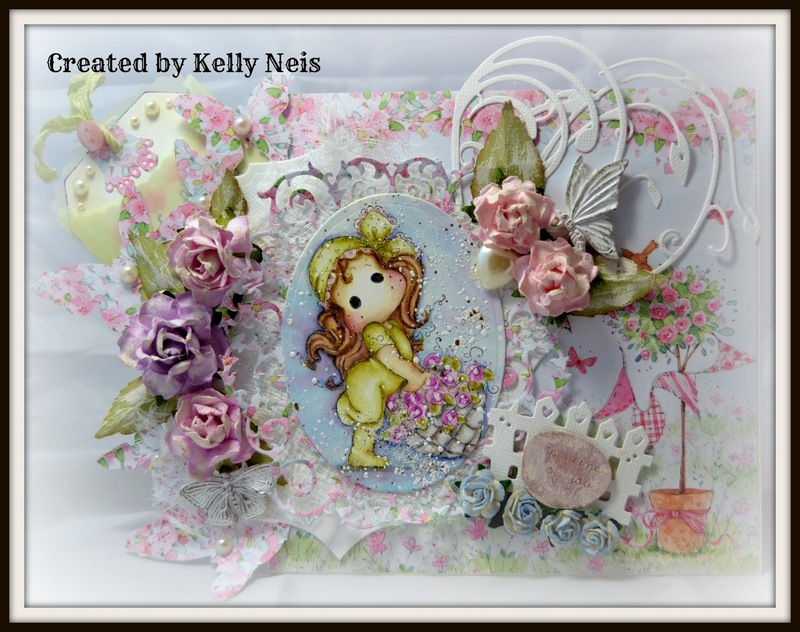 Beautifully designed and colored - this is one gorgeous make - you are so very talented!!! oh my, this is stunning!! I love it, the cute Tilda, the flowers and even the white paint added (I so want to be able to do that!!!). Great looking card. Dear Kelly, I know I've mentioned this .. but wowwww .. .this is INCREDIBLY GORGEOUS! All of your details .. it's so GORGEOUS! It's like walking into a garden filled with all kinds of beautiful goodies! hehehehe!